Hello foodie friends, long time no see! 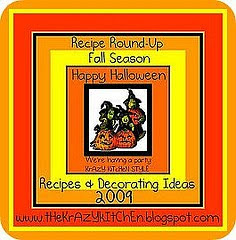 Since I haven’t been doing much with food blogging lately, I’d like to share some of the great recipes I’ve collected over at Pinterest for Halloween. If you’d like to see the recipes just click on the source link beneath each photo. Click HERE to see my entire Halloween collection. Don’t forget to visit my Yummy Food pinboard while you’re visiting Pinterest – if you’d like an invitation so you can start your own pinboards just leave a comment and I’ll send you an invite. It’s a lot of fun! I hope everyone has a safe and fun Halloween! Hi there! This is Emily from EZ’s Recipes posting! Since “my” Simply Delicious Sunday fell on the week before Halloween, I decided to post something fun and, well, simply delicious in honor of the occasion. I went with these Graveyard Cupcakes. I actually found this recipe months ago and bookmarked it way back then with the intent of making them in time for Halloween. I realize that unless you are a regular follower of my blog, you do not know me very well, seeing as this is only the second time that I have posted over here at Our Krazy Kitchen. But if you are a regular visitor over there, it is no secret to you how much I love Halloween. I have been talking about it all month! And now we’re so close! Halloween for me, as a 30-something married adult with no kids yet, means getting all decked out in costume and going to a Halloween-themed party with friends. Hopefully in the near future I will become a mom, and it will take on a whole new meaning for me. My focus will shift from making Halloween awesome for myself and my adult friends to making it awesome for my kids and my friends’ kids. But it’s not just about the costumes and the costume parties. It is about the change in the season. Here in the Midwest, that shift in the weather in mid-October makes for that perfect chilly-but-not-unbearable temperature that just tells you that Halloween is around the corner. The leaves are turning color and falling. And then there’s the best part… the food. Which leads me to the point of my blog post today… my Graveyard Cupcakes. Which I have been dying to share with you, my readers. Just sharing this makes me all that much more excited for Halloween! They were a lot of fun to make, and they are so incredibly versatile that you can be really creative and there’s no going wrong with it. Icing to write on the tombstones with – preferably black in color but other colors could work. Or, if you want to make “grass” you could always use some green! And from there it is pretty straightforward… make the cupcakes and decorate to your heart’s content! Have fun with it! I went with “grass” and “dirt” with mine, and experimented with both chocolate and white frostings. This is something that could be fun to make for a child’s Halloween party at school, or for an adult party… kids and adults will love them all the same! Every have a very safe, fun, and Happy Halloween! I will see you next month, just in time for Thanksgiving! Please visit me at EZ’s Recipes! Remember that all regular memes will appear just below this party for the next 2 weeks. YAY!! WOOHOO!! It’s finally here. Stop by the buffet table and grab a bottle of witch’s brew and a snack. 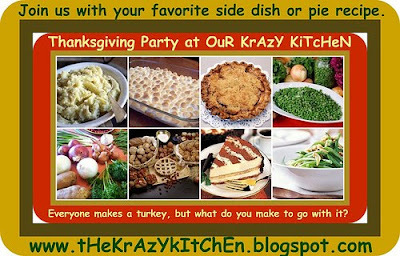 All of us here at ThEKrAzYkItChEn look forward to visiting with you and having a great time at this party. We hope you enjoy yourselves. 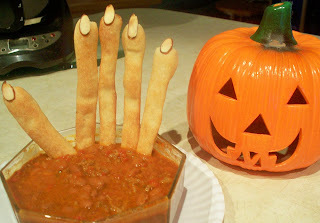 This spooky witch hands were so easy that I can’t even call it a recipe. They are simply Pillsbury bread sticks – unrolled, sliced in half and then formed into long finger shapes (keeping every 5th one a little shorter and fatter for the thumbs), add sliced almonds for the fingernails and bake for 15 minutes at 375. Serve them with some marinara for dipping for a snack, use them on your Halloween party buffet, or serve in bowls of chili or spaghetti for a perfectly spooky meal! …for an important update, a reminder & some important announcements. We are sure many of you have noticed that we’re experiencing a few growing pains around here at OuR KrAzY KiTcHen as we test and expand the waters and horizons around us. Just a quick reminder that the Halloween Party at OuR KrAzY KiTcHeN begins this Sunday. We’re having a party here at the OuR KrAzY kItChEn and you’re invited. 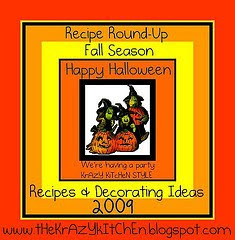 Bring your favorite recipe, decorating idea, pictures, anecdotes and let’s have some fun together. Do you have a special popcorn ball recipe? Do you have a favorite apple recipe? Do you have special way to carve pumpkins? How about a party punch that’s perfect for Halloween? What is your idea of a best costume? We’ll post Mr. Linky on October 18th and leave him in place through Halloween. Write your post piece and come link it up. We’ll all have some time to blog hop and see each other and try recipes. Next we would like to announce the upcoming Thanksgiving and Christmas parties. Do you have a special pumpkin pie recipe recipe? What is your favorite side dish recipe? Do you have special way to carve a turkey? How about a party punch that’s perfect for the Thanksgiving crowd? What is your idea of a best decorating idea? We’ll post Mr. Linky on November 15th and leave him in place through November 28th. Write your post piece and come link it up. We’ll all have some time to blog hop and see each other and try recipes. Do you have a special Christmas Cookie recipe? What is your favorite holiday recipe? Do you have a favorite fudge recipe? Do you have special way to decorate the tree? How about a party punch that’s perfect for a holiday party? What is your idea of the perfect family holiday? We’ll post Mr. Linky on December 17th and leave him in place through Sunday, December 27th. Write your post piece and come link it up. We’ll all have some time to blog hop and see each other and try recipes. We are looking for guest hosts! You can post on any food genre or topic. You can guest for a week or a month, we’re pretty flexible. Perhaps you have a wonderful tutorial for a favorite recipe that you already posted. No problem, re-posts are great when formatted well. 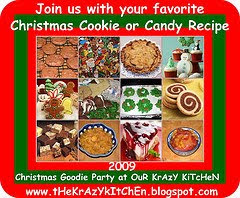 Guest hosts will need to post a new entry advertising their guest posts to oUr KrAzY kItChEn on their own home blog. A Mr. Linky will be added so our regular readers can play along with you. If you’re interested in becoming a guest host, please sign Mr Linky and we’ll contact you ASAP. We’ll post Mr. Linky on October 19th and leave him in place through Halloween. Write your post piece and come link it up. We’ll all have some time to blog hop and see each other and try recipes.